Traveler. Writer. Professional Trip Planner. Group Tour Leader. Delhi Heritage Walks Guide. A New Facebook Travel Blog Page is in town! Somewhere a clock strikes twelve. I don’t hear it as I stand next to the door of my train compartment. It is dark. In the rhythmic movement of the train, in the silence of the bogeys, a hundred questions ring in my head. It’s been 9 months since I quit my job. Does all this travelling really make sense? In my childish desire to wander, am I putting too much at stake, am I drifting? Would it be better to go back and work in an office space? I push my head outside the door, and let the wind hit my face. As my eyes close, so does my mind. Next morning, I reach Haridwar railway station at 8 am. I am now even more restless than the previous night. The train’s late by 2 hours. By this time, I was supposed to be in Rishikesh, at the meeting point in Tapovan. A shuttle was supposed to transfer me from the prefixed point to the event area. Now, I will have to find my own way to get there. I wonder if I should have come on the trip in the first place. The previous night’s questions are still preying on my mind. I finally reach the event area at 10 am, hunched up in a Bolero with a group of musicians. In front of me lies the Ganga, flowing furiously and shimmering turquoise green. I walk up a narrow path, to the top of a hillock and meet Jennifer – the friendly event organizer. Later I am introduced to Anil, who is from The Outdoor Journal - one of my favourite adventure magazines. As we talk, the wind hits my face again. This time I do not close my eyes. Anil and I walk down to the river and stand with the kayakers. There are over 50 of them. The large majority are Indians, but 4-5 have also come down from UK, Canada and Norway. The Nepali team is a serious threat in the competition. Already, I can feel the change inside me. I can’t stop feeling happy. Here, in front of me, are men I do not know at all, men I haven’t seen or heard of ever, but like. I look at them, at their brown burnt faces, and it speaks of the amount of time they have spent under the sun. I look at their forearms and it speaks of all the rowing they have done over the years. 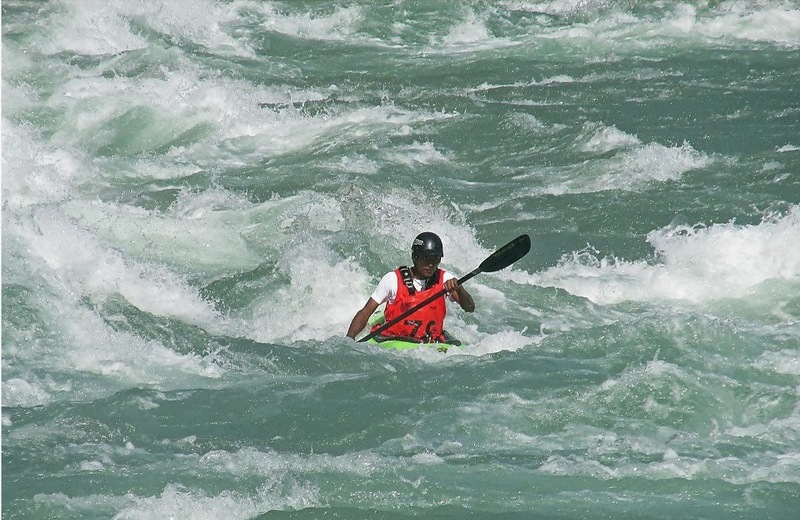 A lot of the Indian kayakers are from Uttarakhand, Himachal and Ladakh. They all look like boys. I am standing with India and Nepal’s top kayakers and they are all boys. Most of them work as rafting guides. I have a feeling they aren’t bathing in money. Kayaking is still a nascent sport in India. Maybe it isn’t even looked at as a sport yet, more as a hobby or an adventure activity. The Ganga Kayak Festival wants to change that notion. It is the brainchild of the well built Bhupendra Singh Rana or ‘Bhupi’ as the local community lovingly call him. An expert kayaker himself, Bhupi has kayaked in the White Nile in Uganda, in Austria and other parts of Europe, and all over India. It is now his burning desire that kayaking gets better recognition in India, that kayakers get more opportunities, that they can stand up to international competition, and eventually the sport gets Olympic representation from India. Once the opening ceremony is done with, the kayakers move towards the banks. There are flags at the starting point and the end point of the race, and they will all go into the river one by one. The winner will be decided based on timing. A spectator table has been set up on the hillock for people to get a birds eye view of the race. The commentator announces the name of the first kayaker, and the lad is ready and sitting in his kayak on the top of a ramp. When he hears the ‘Go’ command, he pushes the kayak and it slides down the twelve foot ramp, into the water. 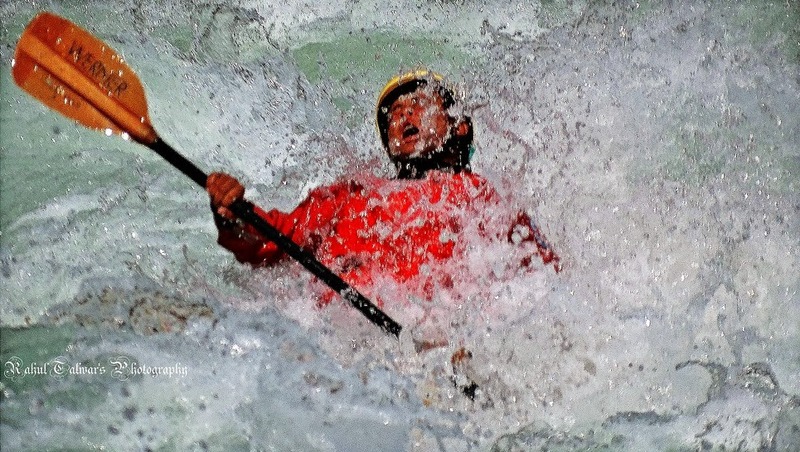 With fast strokes, he speeds and steers his kayak towards the rapids. Everyone cheers. Some of the kayakers are screaming out advice to him. He cannot hear them over the roar of the Ganga, but they try anyway. This is sport at its purest. One by one, the kayakers step into the water. Here at the Golf Course stretch of the river, the rapids are quite powerful and it is a tricky business to manoeuvre through them. A few kayaks unbalance in the rapids, and overturn. But the kayakers roll over within seconds and continue paddling furiously to the finish line. A little later, Anil and I walk along the bank. There are a number of rocks that are jutting out into the river, and end very close to the rapids, so the two of us hasten in that direction. We spend the next hour, near this curve, sitting on some rocks right next to the rapids, watching the river swirl, dip, roar and overwhelm. We watch the kayakers come towards us, and as they weave and toss through the rapids, our knees, our muscles, our arms twitch with anticipation. I know when I look at Anil, that he loves the outdoors just as much as I do, that there lies a sportsman in him, that if given a chance he would love to get into a kayak and battle the river. I know it, because I feel the exact same way. I am introduced to Tipu, a mountain climbing guide. Sitting next to him is another boy, ‘Tony’. Anil tells me that Tony is the coach of the national climbing team. I stare in disbelief. He looks like a wiry kid. He looks so normal. A writer could not have put the previous sentence in a more crude way. Nor more honestly. I talk to them for a while and then clamber over the rocks till I reach and sit over the rock right in the front. One wrong step, and I shall fall right into the rapids. I can see it swirl below me. But I am overwhelmed. The river is so green and cold. The mountain air so pleasant. It is a Wednesday afternoon. Every single person I know is sitting in an office. I realize now that I couldn’t be all that wrong. That maybe this is how I want to live my Wednesdays and other days, in the outdoors, near a river, a mountain, an ocean, in the company of people like Tipu and Tony. Around 4 pm, Anil and I ask Jennifer the route to our camp. We are staying at the Elephant Brook Resort camp. Behind the hillock where the commentators, the staging table, the volunteer tent is set up, a shallow stream flows between two hills. Jen tells us that if we walk along the stream, we shall eventually reach the resort after 2 kms. Anil and I scramble over the rocks. The route is pretty. Brambles come up routinely as obstacles. So does a huge family of langurs along the way. As we plod one, there are a few horses grazing on the opposite bank. They trot across the water to our side, and I run my hands over one’s skin. We walk on, and a light drizzle starts. Sometime later, we reach the resort. In the night, I sit with Tipu, Tony, the Outdoor Journal guys and a few kayakers. It is cold and I am cursing myself for carrying only one sweater. A bottle of rum is being passed around and we are taking large swigs. A bird sings loudly somewhere in the mountains, and one of the men identifies it for us. These men have lived so close to nature. It is getting late. Tomorrow is the second (and last) day of the festival. There will be the mass boater cross, beginners’ and women’s races held on this day. One of the girls participating is only 14 years old. There is a concert. Everybody is drinking and dancing. Even the bemused Brits and Canadians try to shake a leg. Bhupi is going berserk, dancing in the centre of a large gang. He sees me and waves madly. I smile back. Later, I step outside the tent and walk to one end of the camp to stare at the stream, at the mountains. Somewhere a clock strikes twelve. I don’t hear it. It is dark. A hundred thoughts run in my head. Its been 9 months since I left my job. How less I have seen of the world, how innocent these people - these part time athletes part time rafting guides are, how we need many more events like the Ganga Kayak Festival, and how many stars there are in the sky here. I let the wind hit my face. The Ganga flows as it always did, and the mountains look over it as they always do. I did kayaking in Tones Stream, and somehow broken the paddles. God makes me hit a boulder which became my island for an hour. It was terrible. Ganges upstream is too harsh to deal with, i loved reading ur experience. "Does all this travelling really make sense?" Whenever that question arises, come back to this blog and read a coupla posts. Well, that's something new as a competition. I have seen people kayaking but never heard there is any kind of competition being done over there. Thanks for sharing the experience and well yeah, it should get recognition in India too. Have been there "haven't" done that. But ya , did rafting a few times. Kayaking is definitely a much advanced thing than that. No one's there to help you move ahead. Seems quite tough but definitely a hell lot of fun too. Neeraj Narayanan has a Masters in Advertising & Media Communication, has had experience as a Communication Consultant to the Government of Gujarat, and as a Brand man in the IT giant firm - Cognizant. He has also been bitten by jellyfish in the Andaman Sea, been chased by bulls in Spain and ignored by a condescending lion in Gir. On weekends, he takes people out on Delhi tours and Heritage walks, and you could go with him if you like deluded, outrageous men and a history lesson on Delhi's finest. The Story of A Thai "Bar Girl"